Staying warm during winter months is vital to your survival, whether you’re indoors or out in the wild. Hypothermia can be deadly yet preventable. A fire isn’t only important for keeping warm but is also used for signaling for help. A few years ago, I was home alone during a snow storm that lasted several days. Every evening I started a fire in the fireplace because our home’s heating system wasn’t working. I didn’t have any issues until the day I ran out of newspaper to start the fire. I went through the house looking for something that would hold a flame or be strong enough to catch the tinder. Regular paper didn’t stay lit in the same way and I had no clue how to get my fire going. For a few days I resorted to blankets as my heating source but had I prepared myself with some fire starters beforehand, I would have enjoyed some natural heat. In the time of greatest need, these easy-to-make fire-starters will get your fire going in minutes and without any stress. The best part is that they can be made with items that you have around the house, so your cost is virtually nothing. Each fire starter can be used in different environments. For instance, some are fragrant or bulky and should be used in a home fireplace. Others are lightweight and waterproof, making them great for hiking, backpacking adventures or camping. Let’s get into all the types of fire starters you can make. Towards the end of the post I mention some additional tips so don’t miss out on those! These are generally safe and easy to make. I encourage you get your kids involved since it can be a fun and interactive project for them as well! This is one of the fancier fire starters because it’s decorative and smells nice if you add fragrance oils. The first step is to begin melting the wax using a double boiler method. Meanwhile, line your cupcake pan with cupcake papers. Wrap a piece of cotton string a few times around the pinecone- make sure it touches the base of the pinecone and also wraps around to the top. This will serve as a wick. Once the wax is melted, add any fragrance oils and spices you want to it. 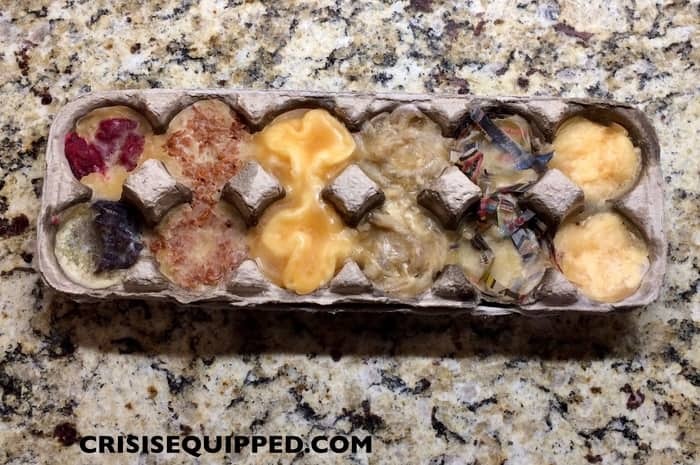 Dip the cones in wax and put them in the center of the muffin tin. Surround the pine cone with some saw dust. Plant a few pieces of cinnamon bark and orange peel to make it look decorative, and pour wax around the sides to cover the base. To use, place in the middle of the tinder and light the top of the string (the wick). You will need a lighter or waterproof match (refer to # 18). As you can see by the photo, this fire starter is not the most convenient to pack for camping but it works perfectly for the home. It also makes an adorable house-warming gift! When I tested it in my fireplace, it stayed lit for over 50 minutes. It makes sense that it would burn for a long time since it’s basically a candle. Cover the jar. Allow the corks to absorb the alcohol for 7 days. Keep this jar away from any heat source. To use, light one end of the cork and toss it in gently with the tinder. You will need a lighter or waterproof match (refer to #18). Make sure you keep this jar away from the fireplace since the alcohol and the fumes exposed when opening the jar are dangerously flammable. I tested this in my fireplace and the flame held for a little bit over two minutes. 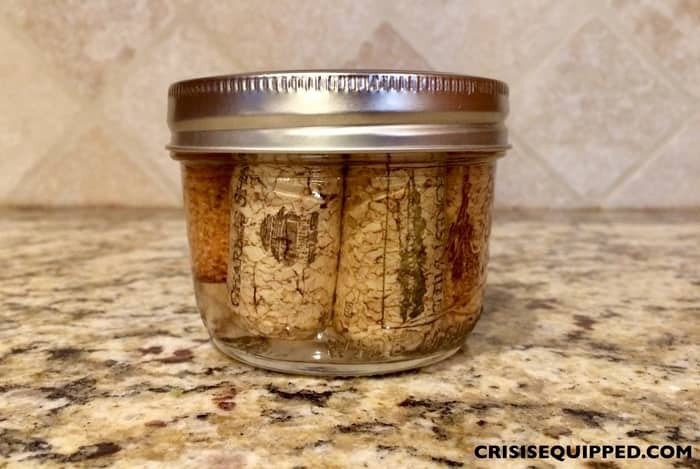 I noticed only half of the cork burned up which could have been due to the alcohol evaporating on one end as it was being burned on the other side. I tried this fire starter with regular matches and waxed matches. The regular matches held the flame for a few seconds but the waxed matches stayed lit for quite some time. 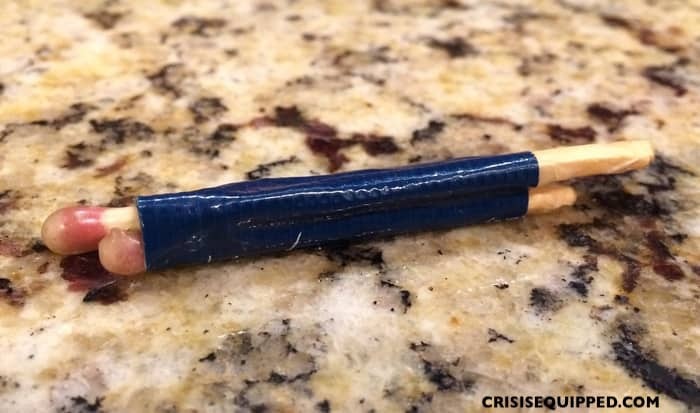 Waxed matches also make your fire starter waterproof, so this extra step is beneficial. Continue reading for a two-minute tutorial on how to make your own. Place the matches in an uneven pattern (refer to photo below). 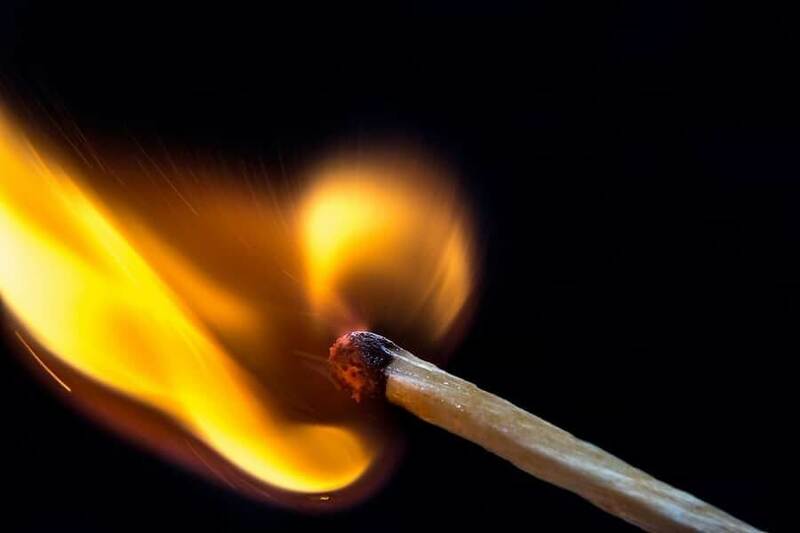 When you alternate the matches, it gives the match head the opportunity to light at different times, therefore extending the life of your flame. 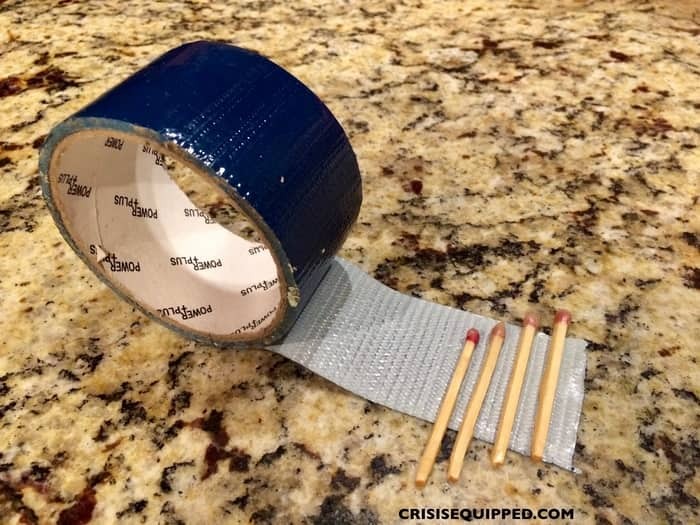 Wrap the matches in duct tape a couple times around. To use, scrape off a little bit of the wax on the top of the strike-end of the match. Strike to light it and place it in between the tinder, either at an angle or straight up like a candle wick. Best when used: indoors and outdoors. These matches don’t weigh too much and they don’t take up too much space. 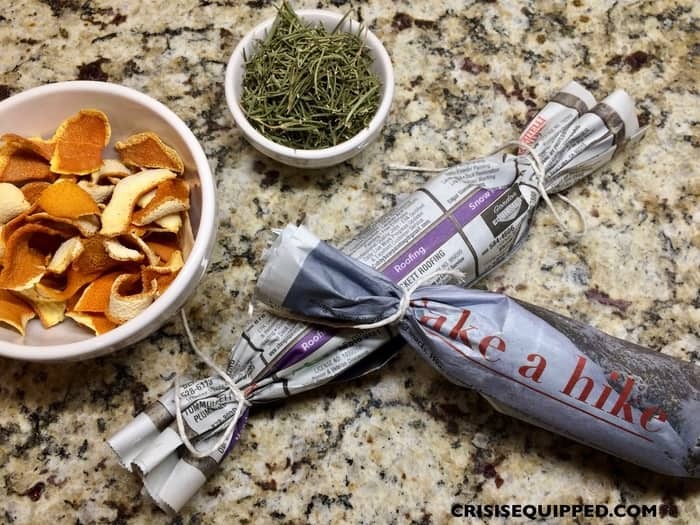 They can easily be stored in a bug out bag, in a camping kit or next to your fireplace. Duct tape burns well because it’s made with petroleum by-products. It’s also waterproof, making it a great fire-starter for the outdoors. Keep in mind that you need to store these with a reliable striking surface paper so you can strike them easily. I tested this fire starter several times. After modifying it, I found that the process outlined above allowed it to stay lit for 4 1/2 minutes. Other modifications I made prior to this didn’t work nearly as well. Begin by melting the wax using a double boiler method. Meanwhile, cut the cardboard with at least three vertical channels. Cut the pieces in 3” squares. Insert the wooden matches into the vertical channels, allowing the match heads to stick out. Dip these into wax a couple times to make them waterproof. Dip and remove them with tongs. 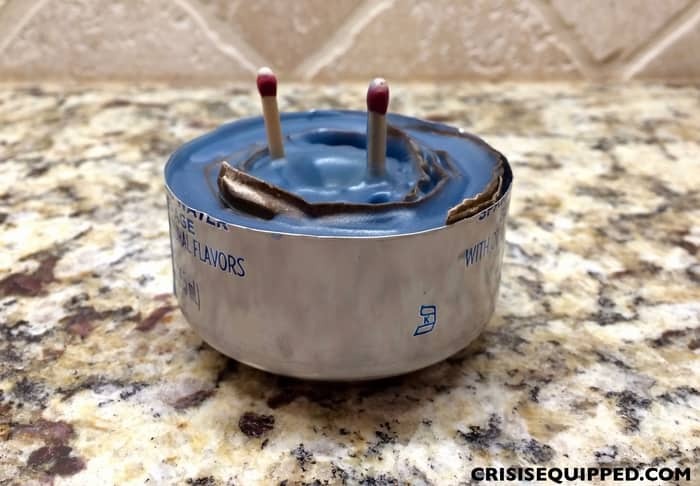 If you don’t have matches, use the same process, but leave one corner of the cardboard unwaxed (this is where you will light it). To use, scratch off the wax from the tips of the matches and light the match. Plant it vertically in the dirt underneath the tinder. Best when used: outdoors, but it’s great for indoor use also. 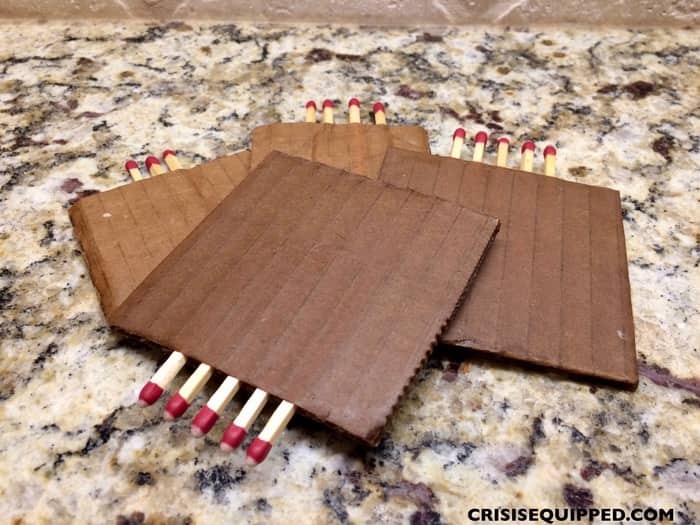 These cardboard matches are lightweight, making them the perfect fire starters to carry in your pack. I recommend you store them in a Ziploc baggie separated by a piece of wax paper. In hot weather, the wax could easily melt together if they’re not separated. When I tested this out in the fireplace, it burned consistently for 4 1/2 minutes. In an outdoor setting it might burn out sooner if there’s wind. Make sure you have enough tinder prepared just in case. Smear the cotton balls with a generous amount of petroleum jelly. Set the cotton balls aside and cut 2” squares of aluminum foil. Then, wrap each petroleum-covered ball in a square of foil. Put them inside the Ziploc baggie. To use, open the aluminum packets to form a little base for the cotton to burn on. Fluff the cotton ball to allow air to get through. Light the top of it and place it in between the tinder. You will need a lighter or waterproof match (refer to #18). These are very lightweight, but rather messy. This fire starter works great outdoors in a wet and dry environment. The aluminum foil will increase their burn time and keep them from sticking to each other and the petrol jelly from getting all over your hands. Since you need to have something to light them, I recommend using an old jelly or peanut butter jar and storing the bag of cotton balls in there with some waterproof matches on the side. The plastic jar won’t weigh a lot (if you’re carrying them in your backpack) and will keep everything in a convenient place. When I tested this out, it burned for about 13 minutes. The flame was surprisingly strong which I’m almost certain is because of the petroleum jelly. Start by melting the wax using a double boiler method. 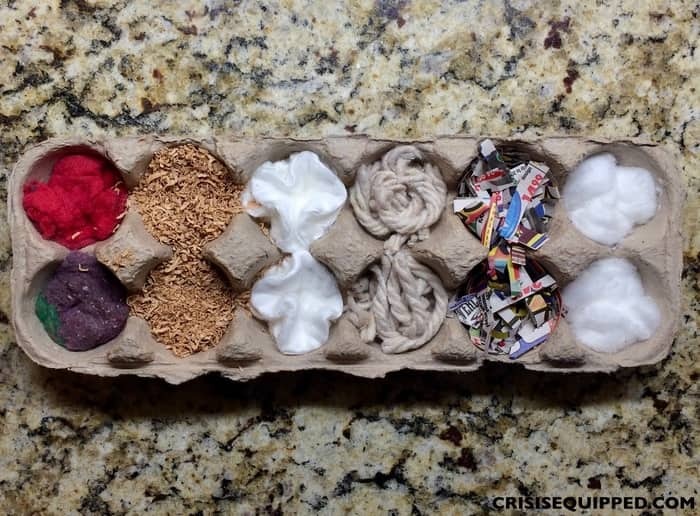 Once melted, dip the cotton pads one at a time, completely submerging them. Dip and remove them with tongs. Let them dry flat in a piece of wax paper. To use, fold the pad down the middle without breaking it in half. Light the cotton that becomes exposed at the top and place it in between the tinder. 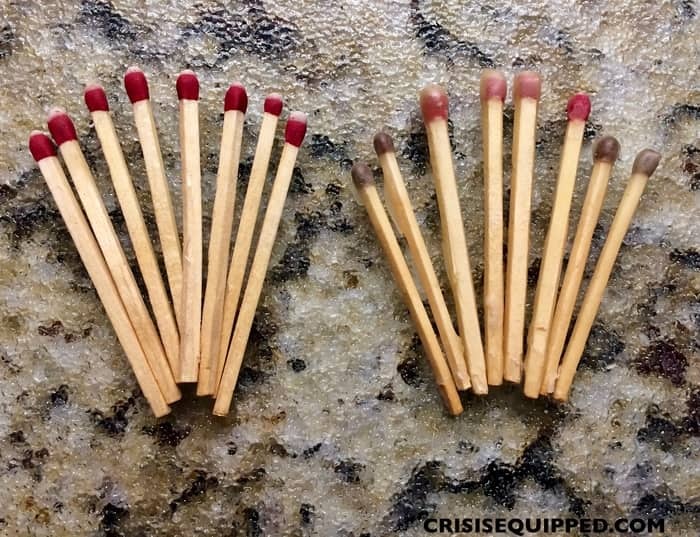 You will need a lighter or waterproof match to light it (refer to #18). These are lightweight and burn for enough time to get your fire going. Since they’re covered in wax, they will be waterproof. 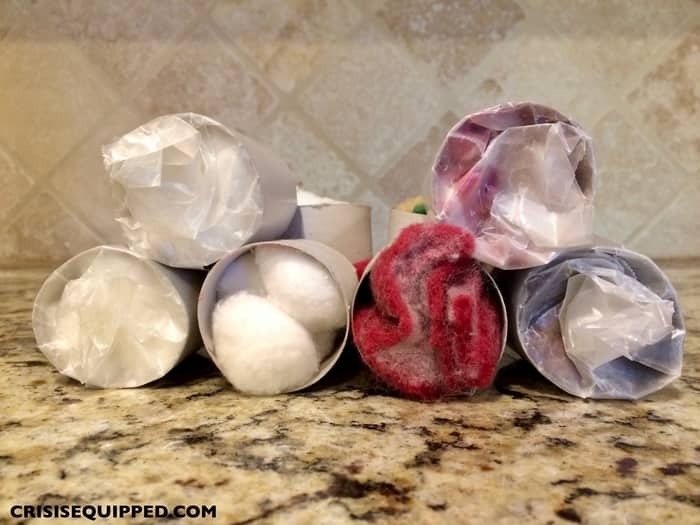 If you store them in a baggie in your backpack, make sure to use a wax paper to keep them separated. During hot weather, the wax can melt together and it can be hard to separate them once the wax hardens. I was very surprised when I tested these out at home. One cotton pad can burn for up to 8 minutes. The flame is strong enough to catch the tinder within a couple minutes and the wax extends the life of the flame. Meanwhile, cut the mop head into 2” strips. Once the wax is melted, submerge the strips into the wax individually. Lay them on a sheet of wax paper to dry. To use, scratch a little bit of the wax off of an end of the cotton. Light it and place it in the middle of the tinder. You will need a lighter or waterproof match (refer to #18). These cotton strips work like wicks. They burn slowly, allowing the tinder enough time to catch on. They can be used indoors and are convenient for outdoor use, especially if you’re backpacking, since they’re both lightweight and waterproof. I tested this mop head fire starter a couple of different ways. I timed how long it would burn if it was sticking straight up and also at an angle. If you stack it straight up, it burns for about 9 minutes but the flame isn’t strong (it works like a candle wick). If you lay it at an angle and light the part touching the ground (essentially it would be burning upwards), the flame is much stronger but it burns within 5 minutes. I modified this later to make a stronger flame. I surrounded the mop head with a small piece of cardboard. I duct taped it a couple times around and lit the top of the mop head. I placed it vertically in the middle of the tinder. It burned much quicker but the flame was much stronger as well. Cut the toilet paper cartons in half. Line the inside of them with petroleum jelly. Fill them with lint or cotton balls. (You can also use shredded paper.) Don’t make it too compact because it will prevent air from flowing through the inside. Wrap them in wax paper. Twist and fold the ends. To use, light a corner of the wax paper and place them inside the tinder. You will need a lighter or waterproof match (refer to #18). These might become a little bulky and can unravel in a backpack but they can still be used outdoors. To make them waterproof, dip them in wax a couple times. 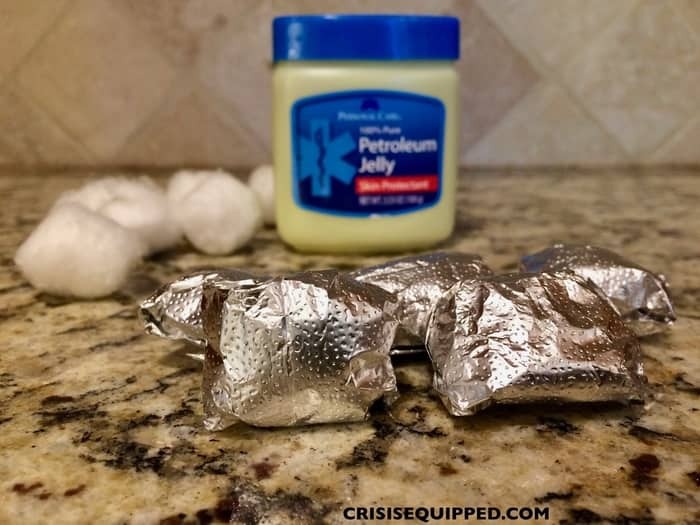 I tested a few of these fire starters with petroleum jelly and a few without. The fire starters with petroleum jelly not only produced a stronger flame but also burned for twice as long as the ones without it. I also tested them with cotton balls and lint to see which one would work best. The cotton balls (with petrol jelly) burned for a little over 4 minutes, which was almost a minute longer than the lint (with petrol jelly). 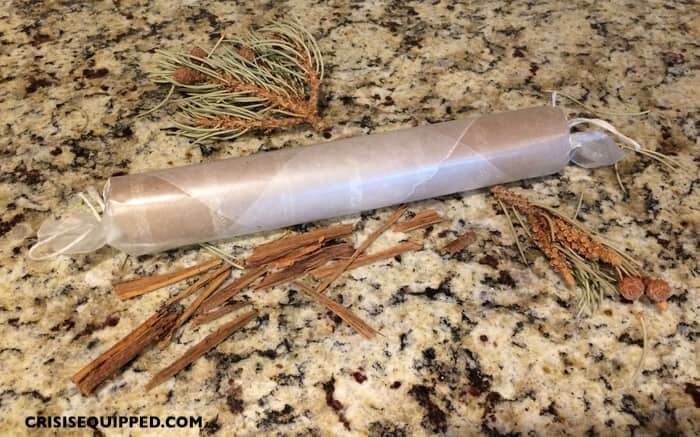 Loosely fill a paper towel carton with pine needles and tree resin. [Keyword: loosely! If it’s packed too tight, it won’t burn through the inside.] Then, put some dried orange peel and cinnamon bark. Roll them in wax paper. 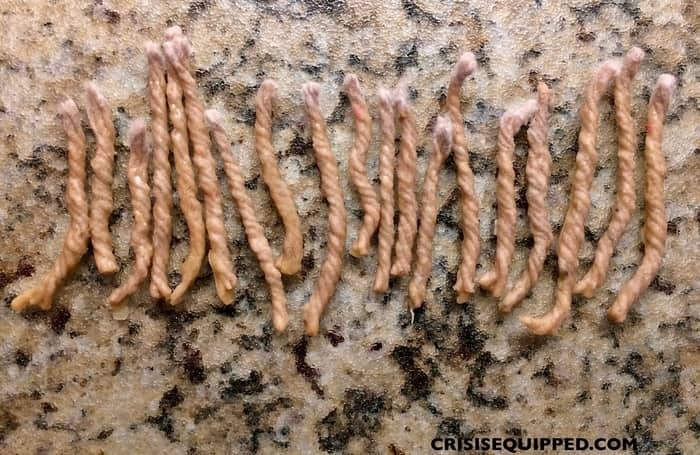 Twist the ends or tie them with a cotton string. To use, place the fire starter under the tinder at an angle to improve air flow and cause a chimney effect. Open the top end of the fire starter and light the wax paper of the other end (touching the ground). You will need a lighter or waterproof match (refer to #18). They’re bulky to take on backpacking and hiking trips. In nature, you’re able to find most of these fillings anyway, so you could collect pine needles and sap without using a carton. The carton keeps them in place and looking neat in front of your fireplace. The orange peel and cinnamon are not just flammable, but they also provide a great scent while they’re being burned. This fire starter will ideally burn for almost 10 minutes. The time largely depends on how much you filled it in with. If you put too much, it might not burn the inside at all. If you put too little, it might burn up quicker. To strengthen the flame, you could spread a little petroleum jelly on the inside of each carton end. While that is melting, cover the cotton balls in the grease of your choice. Pour a little bit of wax into the dixie cup using the measuring cup or spoon. Before the wax hardens, put two cotton balls inside the cup. Cover the sawdust with more wax to seal it. Allow them to dry. Fold the rest of the dixie cup inward or leave as is. To use, rip one corner of the dixie cup and light it. You will need a lighter or waterproof match (refer to #18). This is a great fire starter for the outdoors because it will burn for a long time. If you have wet tinder, it will help dry it and light it later on. Since it’s sealed in wax, it’s waterproof also. I tested these fire starters with petrol jelly, lard and vegetable shortening to see which one would burn the longest. The petroleum jelly burned for 32 minutes, the vegetable shortening for 35 minutes and the lard for 37 minutes. The flame was strong in each of them for almost the entire time they burned. This is perhaps one of my favorite fire starters because it’s incredibly effective and easy to make. For the record, you can light a fire easily with a few sheets of crumpled up newspaper. This process might sound like more of a hassle than anything else but they’re neater and can be made to be waterproof. The photo above shows you the difference between a waxed and an unwaxed newspaper boingie. 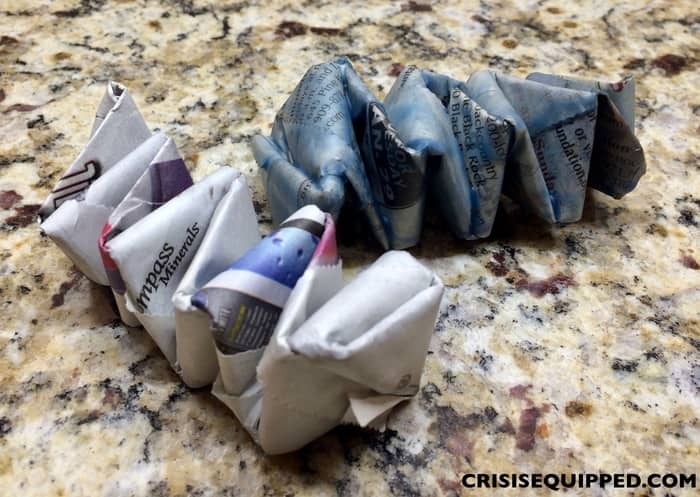 Meanwhile, fold the newspaper into “boingies.” This video will walk you through the process. 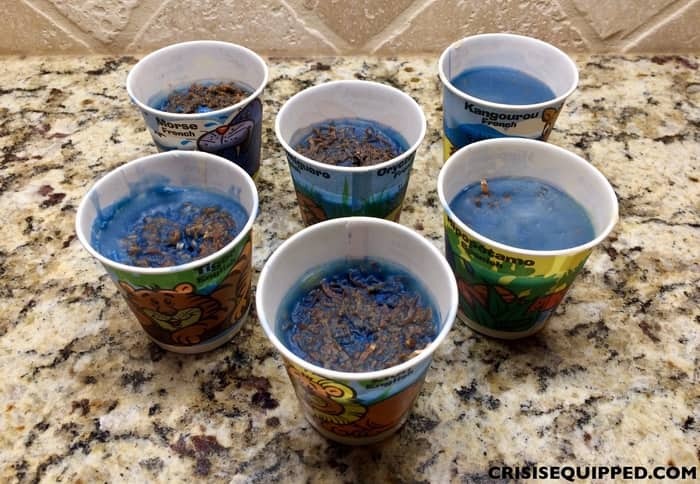 Submerge them into the melted wax. Using your tongs, lay them on the wax paper to dry. To use, loosen the end that you folded in during step 2. Light that corner and place it in the middle of the tinder. You will need a lighter or waterproof match (refer to #18). These are lightweight but can become bulky. They’re probably more convenient for indoor use but they are waterproof (when waxed) so they can be used outdoors without any hassles. I tested both the waxed and unwaxed newspaper boingies. I was pleasantly surprised at how well the waxed one worked. Both of them burned for approximately 7 minutes. The unwaxed version produced a weak yet constant flame. In this case, I recommend you also add loose crumpled newspaper sheets to enhance the flame. The waxed one burned with a strong flame the entire time and I believe it would light tinder rather quickly. I recommend that you place it in between the tinder to allow the melting wax to pour over some tinder underneath it. The photo above shows you what it will look like before you cover it with wax. The photo below shows you what it looks like once it's complete. Meanwhile, fill the egg carton. I tried this project with all of the options listed above. Alternatively, you can also use a piece of charcoal. Pour the wax into each egg pocket. Make sure the wax completely covers the contents inside but still has a little room left at the top. Let it dry. To use, break off a square and light a corner of the carton. Place it in the middle of the tinder. You will need a lighter or waterproof match (refer to #18). Best when used: indoors. This is bulky but will work anywhere. To use outdoors, I recommend making it completely waterproof first, which you can do by dipping each egg pocket individually into wax a couple times. Note: this project uses the most wax. As you can see, I used different fillings to test which one would work best under the same environment (my fireplace). All of these produced a strong flame so I recommend it as one of the most effective DIY fire starter options. The lint and saw dust each burned for 11 minutes. The shredded newspaper burned for 12 minutes. The cotton balls for 13. The cotton pad burned for 17 minutes and to my surprise, the mop head burned for 18. These times are all under perfect conditions (moderate climate and no wind) but they may burn quicker if used outdoors. Lay out a piece of newspaper. Secure the ends with cotton string. To use, place it under the tinder at an angle. Loosen up the top end. Light the bottom end of the newspaper to cause the flame to rise. You will need a lighter or waterproof match (refer to #18). This makes a fragrant kindling for the fireplace. Depending on what you stuffed it with, it can burn from 3 1/2 to 7 minutes. Cinnamon and dried orange peel are flammable. Dip the tampons into the wax for a couple minutes to allow them to soap up the wax. Use your tongs to move them around. 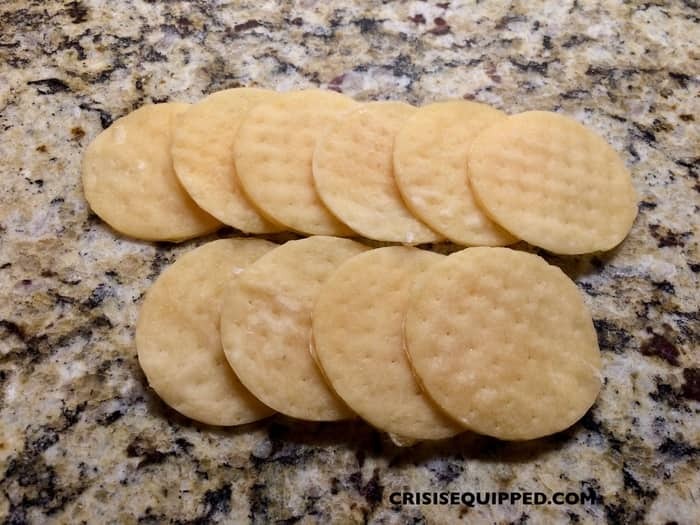 Lay them out in the wax paper to dry. 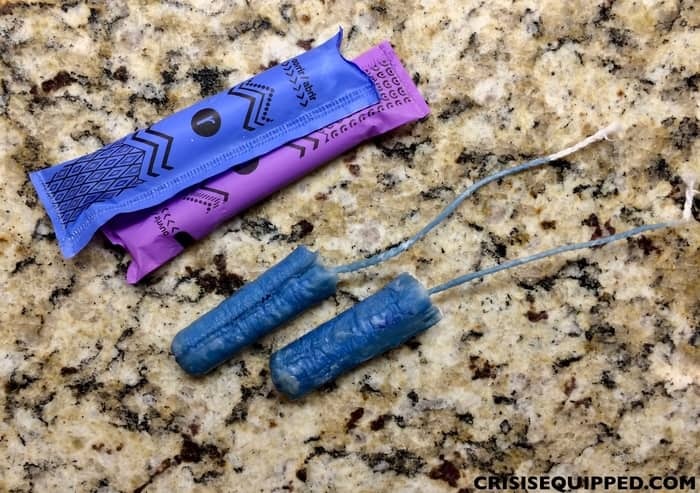 Alternatively, you can coat the tampons with chapstick or hand sanitizer as a last minute solution (if you’re in the woods for example). To use, light the end of the tampon string and place it in the middle of the tinder. You will need a lighter or waterproof match (refer to #18). It might be awkward to use tampons as the top choice fire starter in your home, however if you are in desperate need of a fire in the wilderness, reach into your first aid kit and use a tampon with chapstick or alcohol-based hand sanitizer. This might be just the thing that gets you out of a difficult situation. I tested this indoors, so the time will vary outdoors based on the weather. Under ideal conditions, the tampon burned for 10 minutes and it produced a strong flame. Melt the wax, lard, or vegetable shortening. For wax, it’s safer to use a double boiler method. For lard and vegetable shortening, you can melt those in a pot but just be careful if it starts splashing. Meanwhile cut the soda can at the bottom, making it a little bit over an inch tall. Be extra careful with the edges. A tuna can is the perfect height. Cut 1 inch strips of cardboard and roll them into a spiral. Place them inside the can. Pour the wax (or whatever you’re using) over the cardboard until you get to the top. Leave some cardboard semi-exposed. To use, light the wick in the center and place it in underneath the tinder. You will need a lighter or waterproof match (refer to #18). This is a great fire starter for the fireplace and a bonfire pit where the fire can easily be contained. This fire starter is incredible! When I tested it in my fireplace, it burned for 2 1/2 hours. At the 2 hour mark I tried to blow it out and it wouldn’t. I smothered the flame and lit it the next day. It continued to burn until the wax ran out. I highly recommend this fire starter since you can light it multiple times. Grease, oil and shortening may have different burning times. When I test them, I will update this post to share my experience. Loosen up the steel wool and put it in the middle of the tinder. Lightly, touch the positive and negative terminals of the battery with the wool. Best when used: indoors and outdoors. Be careful with this one! Steel wool doesn’t catch on fire or produce a flame on its own, but when you mix it in with tinder and blow on it, you’ll get a flame. When you need to light a fire, open the package on just one end and squirt a little bit of hand sanitizer inside. Light the alcohol pad and quickly (yet gently) place it in the middle of your tinder pile. You will need a lighter or waterproof match (refer to #18). If you carry a first aid kit in your backpack, you will most likely have a few alcohol prep pads or hand sanitizer. They’re great as an emergency fire starter and they’re cheap. 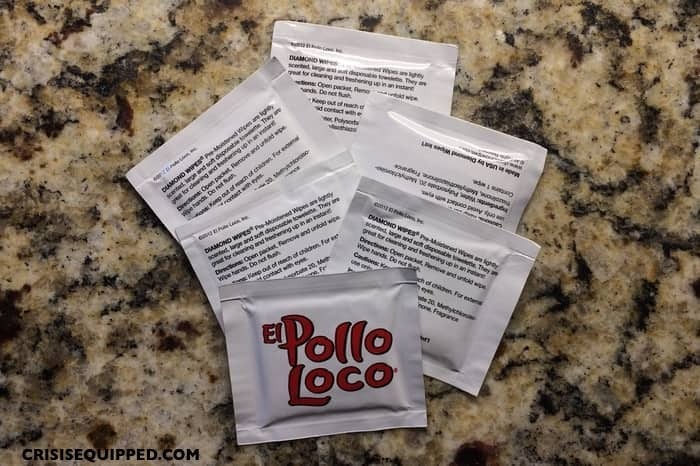 Many restaurants offer these for free- thank you Pollo Loco! It will only burn for as long as it takes to burn the alcohol off the pad. This might only be a few seconds but as long as you have the tinder ready to go, you should be okay. Wet wipes that contain alcohol may work as well but I have yet to try this. Here you can see the clear difference between unwaxed matches (left) and waxed matches (right). Then, dip the matches individually into the wax. Make sure they’re evenly coated. Using your tongs, remove them from the wax and lay them on a wax paper to dry. To use, scrape off a corner of the wax from the match head and strike on a reliable strike pad. These are more convenient when used outdoors because they’re waterproof. Of course they can be used indoors as well, but you’ll probably find it more convenient to use a lighter instead. The match will burn for up to a minute on its own. If possible, pair it up with another fire starter option. You should always have tools handy in case you need to light a fire (or a candle during a power outage). Have a lighting-source in your backpack, bug out bag, in the car and in several places around your home. An artificial flint (ferrocerium rod) keychain is a great alternative as well as a 3X magnifier sheet that can easily be stored in your wallet (you will need the help of the sun for this one). Any type of wax can be used. These are great projects where you can use up all your leftover bits of candle. Beeswax is also a good option, as well as crayons. Melting the wax in a double boiler is the safest and recommended method. If you live in an area with a hot climate, you might be able to melt your wax using the sun. I recommend buying a cheap set of pots and cupcake pan to melt and pour the wax. You can find great deals at thrift stores. The best lint to use is from clothes that are made with 100% cotton. A lot of the clothes that are sold in the United States are treated with fire retardant. These clothes are typically manufactured outside of the US. 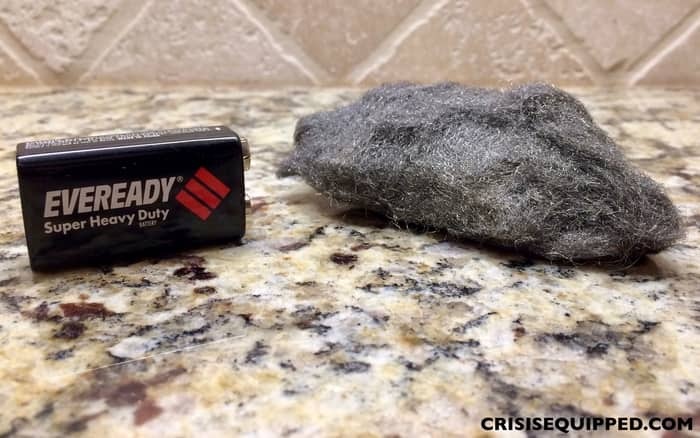 If you don’t know whether or not your lint will work, test it out prior to making one of these fire starters. Also, avoid hair in the lint. Burned hair stinks so unless you don’t mind the smell, you may want to use cleaner lint. When you have exhausted your options, these items can also help get the fire going. These are great for the outdoors since it’s not easy to blow them out. Chips are typically fried in cooking oil which is very flammable. They’re made out of wood (obviously) and they’re thin so they can catch a flame easily. Anything that has a higher content of alcohol will work, like vodka, whiskey, or cognac. Char cloth, or char paper, is charcoal cotton that once lit helps to catch the tinder on fire. The clean kind is recommended. Birch bark, sap, dry foliage, and other natural materials work really well as tinder. When spayed on dry tinder, bug spray (like DEET) will catch a spark quickly. Most aerosols spray cans should work such as hair spray and Febreze room deodorizer. Just be extremely careful because it works like a torch. In order to test these fire starters out, always have a fire extinguisher handy (and learn how to use it first). Minors should try these tips under adult supervision ONLY. Fire is dangerous and should not be played with. 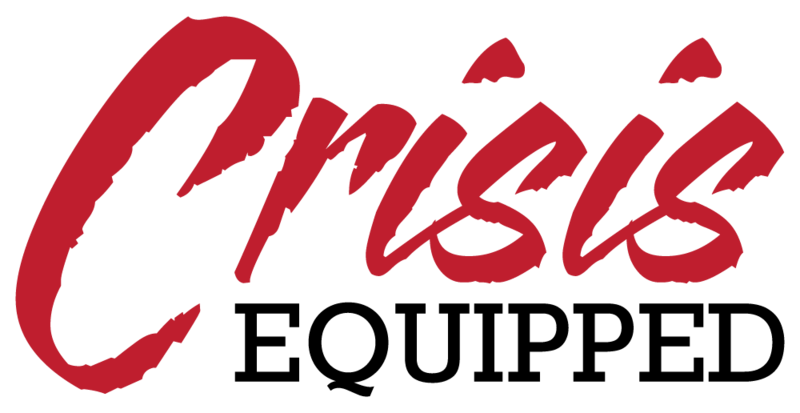 I hope this blog was helpful to you. 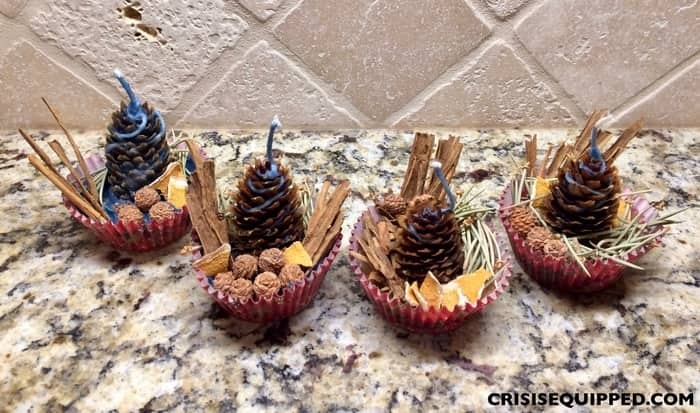 Making these fire starters is a fun and creative learning experience that adults and kids can enjoy together. Buying fire starters might seem like a logical thing to buy but it’s completely unnecessary since most of the supplies we need become our garbage otherwise. Now there’s no excuse for us not to be prepared for cozy winters and summer bonfires!